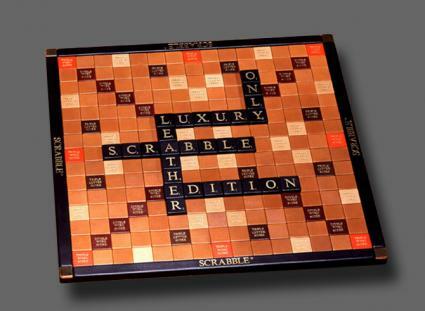 Just as there are very expensive luxury chess sets, there is a growing market for upscale Scrabble sets. One area of particular interest are leather Scrabble sets. These typically cannot be found in regular toy stores and must be custom ordered online, usually from artisan crafts people who specialize in custom work. Artisan-level leather Scrabble sets truly are works of art. Just be prepared to pay a substantial premium for these versions. While there is only one Scrabble design at Zontik Games that is offered in leather, customers have the choice of four main color schemes including magnolia, aubergine, marine and cherry. Before adding the Scrabble set to the online shopping cart, customers further have the option of customizing each color feature, including the center board, frame, letter backs, plinth, scoring surround and tile racks. Each board is set atop Dauphin calf plinth and inlaid by hand. 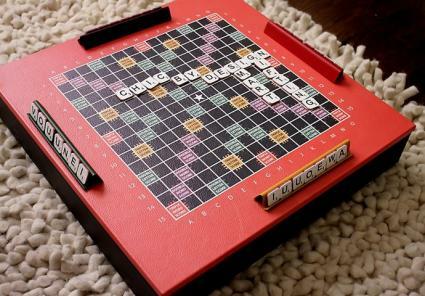 The letter tiles feature bridle hide and there is a Lazy Susan turntable for ease of play. Even the tile bag is made of leather. This luxury set does not come cheap, retailing for $3,955. Zontik Games is located in New York City and ships internationally via UPS. Shipping is free within the United States, but it may take up to 8 weeks to arrive. For customers in Europe and the United Kingdom, it may be a good idea to buy directly from the UK-based artist Geoffrey Parker, who creates these leather sets. The board is made to order and sells for £2,225 directly through his website. Board games for over $3,000 may sound excessive to some people. A more affordable option that is still completely leather-bound can be found at Chic By Design. Listed at $1495, it is less than half the price of Geoffrey Parker's creation. This version has a leather playing board, plus a felt-lined leather tray where the 100 bridle-backed letter tiles and four leather-bound letter racks can be stored when not in use. The set is available in red or tan. Ground shipping is free and delivery takes up to two weeks. Gift wrap is included as well. The husband and wife team of Georges and Monica Bloumels, along with their daughter Sonia, are based out of France, where they manufacture a luxury edition of Scrabble wrapped in lambskin leather. It features gold plated brass corners, metal tiles covered in leather, and four wooden letter racks sheathed in black leather. Customers can choose to have the set in a different language or with a different calligraphy. There does not appear to be any pricing information on the website, but YesICannes.com notes that each "rare and precious edition is worth 5,000 €." Available in Camel Jewel Calf or Red Jewel Calf, the leather Scrabble sets from Aspinal of London include a felt-lined tray for storing the 100 bridle hide backed letter tiles, the four leather-bound letter racks, the rules, and the drawstring bag for the letter tiles. The base of the tray is lined with a non-slip suedette material. The retail price is £950 or US$1,399. Shipping within the UK is $8.50, shipping to Canada or the United States is $14.95, shipping to Europe is $21.00, and shipping to the rest of the world is $30.00. Personalization can take an additional 5-7 days, engraving can take up to 10 days, and deliveries to the United States are sent on a 2-3 day service via DHL. More budget-conscious fans of Scrabble may consider the wooden Scrabble Luxury Edition from Brookstone as an alternative to a genuine leather set. The case is made with a walnut veneer, but faux leather is used for the playing area instead of real leather. This helps to reduce the cost while still providing an extravagant look and feel. Other highlights include the ivory tiles, gold-plated tile racks, built-in storage drawers, and gold-foil detail. The set retails for $199.99 online, and ships in 3-6 business days for $9.99. Scrabble is a game that can take hours to play, while you and your opponents figure out your next moves to score the most points, perhaps argue over spelling, and take the time to consult a dictionary to confirm your words. Make the experience an indulgent one with a beautiful leather Scrabble set that you will treasure for many years to come.